B19 Smart Band features elegant appearance and strong functions, which is just like a personal assistant in your daily life. Monitoring your blood pressure, heart rate and sleep quality; tracking your sports data; reminding you of calls and messages. 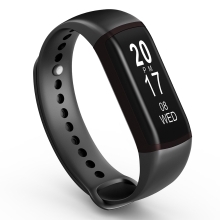 Owing a B19 Smart Band, embracing a better and healthier life. Life Waterproof: Against water, you can wear your B19 Smart Band even in rainy weather. General Design: Elegant appearance, exquisite workmanship, stylish and unique design, smooth touch, B19 Smart Band will shining on your wrist. Calls Reminder: With calls remiander function, you don&apos;t need to worry miss your important calls anymore. Flip to Light The Screen: Bulit-in flip to light the screen, when flip your wrist, you can easily see what you want. Lasting Battery Life: USB plug-in design, no need any cable, more long standby for 15 days of efficient battery life. BT Remote Camera: When connecting with phone, you can remote control camera, capture the important moments of your life at any time. Blood Pressure & Heart Rate Monitor: Tracking your healthy condition at any time. Sleeping Monitor: Record and analyze your sleep time, sleep quality. Suitable Smartphone System: For Android 4.4/iOS 8.0 and above. Support System: Android 4.4/iOS 8.0 and above.